I have been working on MVC for close to 4 years now and have been out of touch with Web Forms. In one of our product (web forms grrrrrrrrrrr) I had to help our my team who was facing a weird problem. So this if for people who are facing the exact same problem. Add the runat server to your form tag for your clientscript or startupscript to work. This post is for self (so that I don’t forget) and for people who are frustrated (like me) while configuring Email Router for CRM 2013 Online. Hope this helps someone who is facing LogonIdentityExWithUI problem when you give Load Data. Its been a while since I did a blog post. Not that I didn’t want to but just that I got extremely busy with my work and didn’t have time to spend on tech blog (usual blogger excuse). I am going to try and get back to writing tech blogs again. In the past few years I have had the opportunity to meet some great people and learn so much from them. I would be blogging about a lot of very interesting things which I found it from tech world and certain gotcha’s and lessons learnt. I think I have taken enough time to bore you with my recent past. Stay tuned for some interesting posts in the future. programming and poetry should never ever ever be combined. this does, however, explain jsonp in 26 words. i have a new friend named jason p.
Lately I’ve been trying to curb the overuse of AJAX. Basically it’s great that we can make all these calls to the server, but why make things so complicated. Why not just send all the data to the page and then handle it on the client side. Thinking back to those kool Hello World Hello Ajax demo’s we all did back in 05 I wanted to revisit the classic cascading drop down scenario. I won’t bore you with the server side (use what every you want I)but here is the client side HTML. The child dropdown contains all of the possible values and all options should initially be hidden. 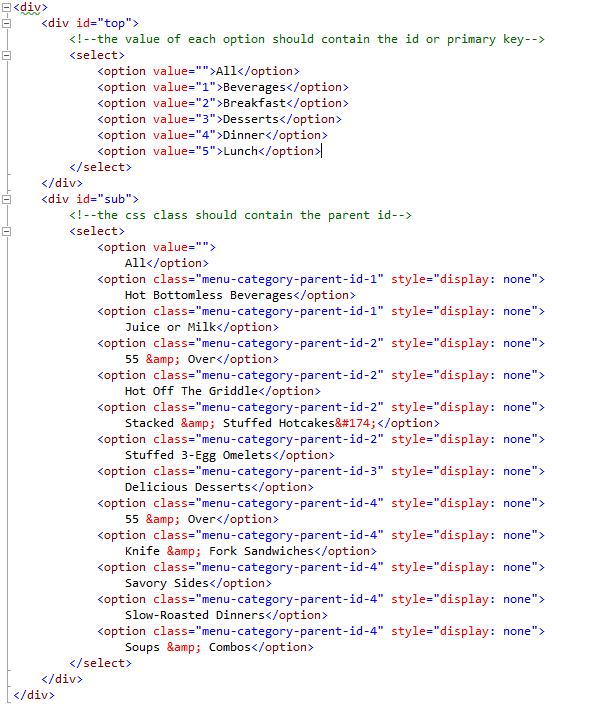 We are going to use the class of the option to store it’s parent ID. That is the key. working a new project. no documentation at all. i did find one comment in the code so far which i have shared below. One of the responsibilities of my current position as a SQL Developer is to prepare the scripts for deployment. For quality assurance reasons we store all of the database objects in a source control system, so each object is stored in a separate file. This can make deployments very tedious, depending on the volume of files. These processes are my processes for an internally managed application. These scripts and processes are not distributed in any way, and quite frankly are not suited for that purpose. This does not cover any T-SQL best practices. There are far better articles written by far more knowledgeable people covering these topics. Click here for a list of best practice articles. 1. Each script must be able to be executed multiple times without error. There is nothing worse that running a script to test a deployment and then getting an error because an object already exists or a key violation because the data already exists. All scripts must check for the existence of the finals state before doing anything else. For stored procedures, this may me a conditional drop and then create and for tables this may mean checking for column existence before running an alter statement. 2. Object permission must be part of the object script. Your mileage may vary with this one, but I am a fan of explicit permission granted to a database role for each database object that is being deployed. For newer architectures your roles may have blanket permissions to a schema, but I have not seen many instances of security set up this way. Having the permission set at the end of the script (just in case you drop an re-create it :-)) will save a lot of headache if you ever need to setup the application in a new environment. NOTE: Please do not forget the batch separator (i.e. “GO”) in the script. I hate seeing permission errors where a stored procedure is trying execute permissions to itself. 3. Group the data scripts by table. If you follow guideline #1 this shouldn’t be much of an issue, but if you have the same or worse, similar, updates in multiple places you could in a world of hurt. 4. Try to group like objects. Tables – With the exception of using a function in a default value or check constraint, it is a pretty safe bet that you can deploy all table changes first without error. The most tedious part of deploying tables is their relationships. Since they are dependant on one another, order is important. I have not found a perfect way to deal with this dependency. Views – Again, it is possible to use functions as part of a view, but I wouldn’t recommend it. It is also possible to reference another view as part of a view definition, but I would not recommend that either. Pay attention to the order, just in case. Functions – In SQL Sever you cannot call a stored procedure as part of a scalar or table valued function, so deploying these before the stored procedures is advisable. Stored Procedures – These are next to last because they can use any of the previous three objects. They may, however, be dependant on one another, so watch the order here as well. Triggers – Triggers can be added to tables or view and they can use stored procedure or functions, so I save these for last. 5. Take as much care with the rollback scripts as you do with the future scripts. What can be worse than beginning a deployment and then realizing that you have to rollback. After the rollback completes, you realize that you just dropped a primary table in your database that you just meant to alter. Oops. For this reason I will hand write table rollback scripts. I use a script generator like ScriptDB to generate all of the other rollback scripts a week or so prior to deployment to capture any run fixes that were deployed during the development process. I maintain a 1:1 relationship between deployment and rollback scripts. I execute the rollback scripts in reverse order to the deployments scripts. No muss, no fuss and no additional lists of scripts to maintain. 6. Don’t forget the jobs! If you update requires job changes, add those to source control for deployment as well. All of the objects that are part of the deployment should be scripted. 7. Store the deployment order some place safe. The largest deployment that I have worked on to date was over 600 individual scripts, with many exceptions to the steps listed above. Rebuilding that list would have taken a large amount of effort and testing, which I really did not have the time to do. I prefer to store them in a database table table so that the list is available to other developers to make the necessary changes. I never want to be the one left holding the ball, let alone the one to drop, so let’s keep this in a safe place. Take the list that you have so tediously maintained throughout the development process and script it into a file. I use sqlcmd to deploy all of the database objects, so this is a relatively simple process. Be sure that error handling is written into the script. I prefer that the batch ends when an error is encountered. If you followed #1 above, you can fix any errors and start the batch from the beginning. The table that I use to store the scripts has the definition below. I have a template parameter for the database in the script. Use Ctrl+Shift+M or click the e “Specify Values for Template Parameters” button to populate this field. To create the batch file used for deployment I use to SQL outlined below. I find this option to be very flexible. Run the result to text. I hate to use cursors like everyone else, but this ensures that I get the proper format out. Take the output of this script and save it as a batch file and VIOLA! Change the local path and order the scripts in reverse order to generate the rollback batch file. Now you have a quick, dependable and free SQL deployment method.